Admittedly, my old view of Marseille came from mob and war stories in books, on TV and movies. Now after visiting the city, I’m impressed. To me Marseille’s story is one of resilience. It shows how perseverance conquers adversity. The earliest settlements in the area, now know as Marseille, date back to the Paleolithic period (60,000 BC). Residents lived along the Marseille basin which was about the size of the current city. The location was ideal for all types of sea activities. It was protected on the opposite side from the strong northerly wind, Les Mistral, by a range of tall mountains. A popular legend is that Massalia was a wedding gift from the Gallic king, Nannos, to his daughter upon her marriage to a Greek sailor. The story supports the belief that the nations were peaceful at that time. We do know the blending of the two cultures resulted in the introduction of olive oil, wine, ceramics and Grecian gods into the Gaelic world. From 600 BC to 49 BC the independent Greek city of Massalia grew into a prestigious seaport. Its sea trade, its infrastructure and its political system dominated the trade routes. They distributed goods along the coasts of Gaul to Iberia. Caesar captured Massalia in 49 BC. Artifacts unearthed at a site where the History Museum now stands attest to the Roman influence on the town. Massalia’s habits and customs, however, remained strongly Greek. Even the language. From the Roman age through medieval times, the city that became Marseille saw great prosperity and near-total destruction. The Visigoths captured Marseille and the Franks sacked it. In the early 10th century, Marseille experienced a revival as part of a Provençal territory which was divided in two. Arles and Marseille were the capitals. During the twelfth century, Marseille was an independent republic with strong trade relations and naval prowess. A currency of its own boosted the city’s stature as well. Marseille maintained political autonomy until it was absorbed into the Kingdom of France in 1481 along with Provence. Through years of religious wars and changes in French rulers, Marseille maintained its role as a major center of commerce and a vital port for defense. The city had an arsenal and fleets of warships. Under Louis XIV, Marseille was given “free port” status. To affirm his political power, the king ordered a new urban plan for the city. The size of Marseille went from 65 hectares to 195. Straight streets lined with mansions appeared, including the Canebière that leads to the Old Port. The new city had a fort and a new town hall. Thought to be carried from Central Asia through ship crews, the Great Plague of 1720 devastated Marseille. Over 30,000 out of the city’s population of 90,000 died from the outbreak. The people of Marseille supported the Revolution sending hundreds of men north to Paris to fight. Along the way the rebellious marchers sang a song that is now the French national anthem, La Marseillaise. The middle of the nineteenth century was a “boom” time for Marseille. The port became a maritime hub for the rest of the world. Trade with the Far East and major shipping lines boosted the creation of a modern culture. At the same time, prosperity cut a deep wedge between the already divided city. The rich against the working class. Refugees, expelled or fleeing from their countries after WWI, brought droves of Italians, Corsicans, Germans, Armenians and Spaniards to Marseille in search of work. The world of gangsters and the underground grew under leaders such as Carbone and Spirito. The image of Marseille as a den of violence, drugs and crime is persistent in the eyes of many. Big screen movies and TV series, still today, such as “Marseille” help perpetuate the city’s reputation. Marseille is the second largest city in France today, so an element of such activity can be expected. It’s how Marseille survived the apocalypse during World War II that is nearly incomprehensible. German troops seal off the Old Port quarter of Marseille, the harbour side community. The Old Port and surrounding districts were bombed and destroyed. The Germans, the Vichy government, the Militia and the French Popular Party actively suppressed the people. In January, 1943, more than 2,000 Marseillais were rounded up and sent to concentration camps. Like a phoenix, Marseille thrives. Marseille has an enduring charm. The metropolitan area of 1.5 million people consists of a melange of people of all races, creeds and nationalities. It is a place of huge economic, social and cultural significance to France. Marseille is proud and it shows. I’m not a very patient person. Never have been. When I moved to France, I knew it would try my patience. Moving is one thing. Learning a new way to deal with bureaucracy and red tape takes frustration to a whole new dimension. My move to a new apartment in Uzès, on top of recovering from my September 18th nightmare, has brought back to mind how difficult it is to do simple things in my new country… like having WiFi and telephone installed, or expecting dependable heating and hot water. You know, the essentials. I’m now two weeks in my new place and I’m still struggling with all of the above. When I recently complained in an email to a new friend and blog follower, she reminded me of a post published five years ago. “You sound just as frustrated as you did when you first landed in Uzès,” she said. I must say, it’s worth a bit of agony to be here. I’m literally one step off street level. Three steps from my front door into the living area. While the magnificent view of the Duché is no longer outside my office window, and the Medieval Garden is missing from my bedroom view, I’ve gained a regal courtyard and easy access. The latter is a godsend. The September 18th nightmare wasn’t supposed to happen for at least five years. Five years from now I would have said “it’s time to go back to the States.” My whirlwind adventure in France would have ended with a big grand finale. That’s not how it’s going to end now. I haven’t had my fill of France. Instead, I’m looking forward to stepping out this street-level door to spend more time with French neighbors and friends. After five years of watching the French enjoy their special kind of lifestyle, I’m going to try to participate. Yes, I’m going to be out there and I’m going to be speaking in French! Stay tuned for next week’s news and another great adventure. A French language school in Aix-en-Provence. I’m so excited and you’ll be coming along, too! Second of the series on train rides from Barcelona into the South of France, let’s go to Carcassonne. Visitors to France who fancy medieval times, Renaissance festivals, dragons and gargoyles must run — not walk — to the village of Carcassonne. It’s like stepping into the back lot at Universal Studios — except it’s for real. Since the pre-Roman period, a fortified settlement has existed on the hill where Carcassonne now stands. The earliest known site dates back to the 6BC when a fort was built overlooking the ancient route that linked the Atlantic with the Mediterranean and the Iberian peninsula with the rest of Europe. Between 1BC and 27BC the settlement, known as “Carcaso Volcarum Tectosagum,” became a Roman town, “Colonia Iulia Carcaso.” During the late 3rd and early 4th centuries, a wall was built around the settlement — a fortification that has been destroyed, remodeled and restored throughout the ages. to give Carcassonne it’s distinction as a World Heritage site and one of the best restored fortified cities in the world. The walls of Carcassonne and the people who lived within were prime targets for those who desired to have such a prime location for their settlements. The Visigoths ruled the city through the 5th and 6th century and are believed to have erected a cathedral on the site of the present structure. After Arab rule, then a successful siege by Pepin the Short, work began on the Romanesque Basilica of Saints Nazarius and Celsus in 1096. The outside of the cathedral, like others of its kind in the south of France, has no flying buttresses. Stability for the structure is provided by interior vaulting. By the end of the 13th century, Carcassonne had acquired a castle, Château Comtaland, and an extension of the fortified wall. The castle, as today, has a drawbridge and a ditch leading to the entrance. One section of the wall is notably Roman because of its red brick layers and the shallow pitch of its terracotta tile roofs. Architect Eugène Viollet le Duc is responsible for guiding the restoration of the city that is enjoyed today by so many. Starting in 1855 he completely designed the city, rebuilding what was nothing more than ruins. One of the mythical, if not factual, stories about Carcassonne is shared by tour guides of the city today. It has to do with the naming of the city. The story claims that during one of the many sieges on Carcassonne, the people inside created a ruse to fool the aggressors. Because Carcassonne had so many attacks it was believed the inhabitants of the place might be suffering from malnutrition and lack supplies to defend themselves. Knowing they were at great risk, one resident, “Dame Carcas,” grabbed a healthy pig — one of the last in the city — stuffed its belly full with food, then threw it over the wall as a “present” to the enemy. On receiving such a well-nourished sow, the charging army retreated, assuming the entire population inside the walled fortress was well-fed and ready to defend their city. Hence “Carcassonne” is derived from “Dame Carcas.” Her image (or so they say) can be found on a city gate. Visitors to Carcassonne today will find there are two parts of the city — the walled city and a “modern” city, founded by some of the inhabitants who were thrown out of Carcassonne in 1347. You can see the walled city for miles around. Its approach from below — after walking up quite a distance from the new city, or after walking from the parking lot at the top of the hill — is an amazing sight. Not many of us in the 21st century have had the privilege to see a “real” medieval castle — much less, enter it over what had been a drawbridge. Once inside the huge, wide, stone passageway, the ancient-ness quickly fades away into modern-day tourism. Gift shops, candy stores and souvenir places are everywhere along the narrow streets. If you’re not careful, you’ll miss the tourist office that’s just inside, to the right. My advice? Find it and schedule a walking tour. The guide for my visit was superb. Another idea? Ride the small train that encircles the grounds, inside and out. It’s not just for kids … or should I say …. for kids of all ages. My first trip to Carcassonne was in November. As in the rest of Europe, tourists are mostly at home. That’s a good time to hire a guide who will walk with you inside and outside of the city wall. The stories and images recounted by an imaginative docent are priceless. If you want to see Carcassonne with hundreds of thousands of others on one day, visit July 14th — Bastille Day. The crowds are as bad as you can imagine, but the fireworks display is magnificent. “The best show in all of France,” some say. Click here for a great map of the “modern city” that shows where’s the best view. Click here for more information on Carcassonne and upcoming events. Enough reminiscing. Fast forward to this weekend in Nimes. The ancient Roman city in the south of France is going to party like it’s 2016! One of the most exciting events in the Languedoc region of France is coming up Pentecost weekend (May 12-16) in Nimes. The Pentecost Feria brings Bulls, toreros, herdsmen from the Camargue, and tens of thousands of jubilant spectators to the once-Roman town of Nimes and its Arena. Celebrated since 1952, the Pentecost Feria has become a wildly popular festival for people of all ages. There’s dancing in the streets and all types of merry-making throughout the festival, including parades and abrivados (bulls running in the street). Ferias are by far one of my favorite things to do since moving to France. While fighting bulls might not be for everyone, there is much more to the nearly week-long event. If you like brass bands, horses, paella, Spanish dancing and all the fanfare, it’s all at the Feria. If you want to experience a bullfight, join the crowd. This part of France is one of the few places in the world where the tradition of the Feria, with all its pomp and ceremony, still exists. Exhibitions are held in the various museums during the feria, including the Museum of Taurine Cultures. Art galleries are filled with images and sculptures of toros and toreadors. Food vendors and bars line the streets with wine, beer and pastis — one of the south of France’s famed drinks. This is by far the most important of the two Nimes ferias that are celebrated each year. If you are anywhere in the vicinity, head that way. It promises to be a party for all! Continuing on my sentimental flashback to three years ago when my “life in France” adventure began. This day I realized my idea of blogging along the way was wrought with technical problems — the joys of traveling abroad had begun. Procrastination is one of my biggest faults. Packing for this trip was no exception. Yesterday was airport day. My iPhone and tablet were put in accessible places to keep me occupied sending emails and blogging during the 5-hour wait in Newark. Little did I know that I’d have technical problems that kept me from connecting all day. Now in Barcelona and ready to throw the laptop in the trash. Looks like I should have bought an iPad! If you want to see Carcassonne with hundreds of thousands of others on one day, visit July 14th — Bastille Day. The crowds are as bad as you can imagine, but the fireworks display is magnificent. “The best show in all of France,” some say. Here’s a great map of the “modern city” that shows where’s the best view. Another journey to Carcassonne is in my future, hopefully soon, as I venture through the Minervois region in the south of France. The Barefoot Blogger has an apology to make. When I was giving hints about moving to France and getting rid of stuff, the rest of the story hadn’t played out. Don’t stay so long on your return that your kids start giving your stuff back! Now, where does it all go? Here’s the last view of my warehouse storage. I’m keeping this because ???? If my rush moving to France wasn’t self-imposed, I could complain about so much to do. Instead, I just grin and bear it. Then grin some more. 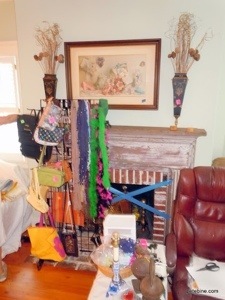 An estate sale and clothing sale over the last two weekends were just the tip of the iceberg. In between there’s been 1) packing the ten 18″x18″x16″ boxes to ship to Marseilles; 2) contracts to negotiate with the rental agency for the apartment, 3) a bank account in France to open and…4) the paperwork for a long- stay visa. There are a few lessons learned from each of the above when moving to France. First of all, recruit all the help you can! My incredible son from Birmingham donated two weeks of his time to help me sort out my treasures to sell ( aka “stuff”, “junk”) while trying to keep up, remotely, with his job. Also, two of the best friends a gal could ever ask for pitched in to organize, price and sell everything before and during the sales. Second, call your sale an “estate” sale, not a “moving” or “house sale”…and certainly not a “garage sale”. It brings in a totally different type of buyers and allows you to sell items at a slightly higher price point. “Perceived” value. Advertise! It will cost to place ads, but it’s worth it. Estate sales are hard work. Don’t skimp on letting people know about them. Ads on Craig’s List, estatesales.com, bookoo.com, and your local newspaper(s) are good places to start. Well-placed yard signs are important too. Clothing sales are more lucrative if you sell jewelry, handbags, scarves and other accessories as well. Buyers will scoff up $1 and $5 costume jewelry and those sales add up! Provide a separate place for ladies to try on clothing. Have mirrors everywhere. If women are in the “dressing” room with other ladies, they often encourage the others to buy! If a potential buyer wants an item but, for some reason they can’t carry it with them, offer to ship items to them (for a price.) For example, a couple came to my estate sale who were visiting from out of town. They purchased some large ticket items and also wanted a canister set. They couldn’t carry it back home. I missed the sale because I didn’t think fast enough to ask if I could ship it to them. Allow buyers to return during off- hours. Some of the biggest sales were made the day after the public sales. I was home packing boxes anyway, so when people came by, I let them see what was left. They always bought something, probably because they appreciated the special attention. Mark items BOGO (buy one get one free) the last hours of the sale. When traffic slows down, change your outdoor signs to read BOGO. It’ll bring on new customers. After hour sales go back to full price. Accept credit and debit cards. This is probably the most important lesson learned. A friend loaned me a “square” that allowed customers to use credit to buy the items. There’s a charge to use the service, but it’s worth the almost 50% increase in sales. Provide shopping bags at the door. Customers will fill them up with items they want to buy. It’s much more convenient and efficient for you and the shopper than carrying stuff around or leaving items at the checkout. Sending household and personal items in boxes through a shipping company will save you from hauling extra bags on the airplane. The important thing to remember is whether the stuff in the boxes is worth the shipping fees. When I get to France and unload the boxes, I’ll let you know if I brought the right things with me. Right now I’m prioritizing by replacement cost in France. My cost shipping 10 boxes is estimated at $1000. The contents of each box must save me $100 in replacement cost, or it’s not worth the hassle. Filling a box with personalized stationary, books, and office supplies doesn’t make sense. Packing coats, my favorite outfits, some kitchen utensils and most-used cooking pans is my plan. I’m also throwing in new linens and towels. The quality is better than I found around Uzes and the pieces can be used to pack around breakables instead of using paper or bubble wrap. When the boxes are full, wrap each with packing tape… 3 rows of tape around each side. Then cover the box with “shrink wrap” plastic. I didn’t know it existed, but you can buy rolls of plastic that is wide enough to cover a box. It comes in a package like Saran Wrap and you can purchase it at Home Depot or Lowes DIY store. The shipping agent says preparing the boxes as described above improves the security of your shipment by up to 80%. Opening a bank account in France is a requirement for renting an apartment. The agent and apartment owner like to have monthly payments set up through a draw on the account. In order to open the account you must show proof that your IRS taxes are paid in the US. I gave them the cover page from my tax forms. You must also show proof of residence in France. Don’t ask me how crooks get away with foreign bank accounts! Guess they know all the angles. Find someone you know who can understand French legal documents. In my case, I lucked out that my son, who was helping with the move, has experience reviewing similar paperwork. He served in the Peace Corps in Cameroon and worked with banks to make loans using some of the same legalize. If that fails, use the Google Translate app. Assuming the French documents you want to translate come to you in a PDF format, you need to install an Adobe application that can convert pdfs to Word (or MAC). Then copy and paste the content into Google Translate which you can access online. The translation may not be the best, but it can help you with the highlights. Then ask your rental agent to go over it with you. Long stay visa To stay in France longer than 90 days at a time, you must have a “long stay” visa. Look on the Internet for the French consulate that serves the area where you live. The southeast consulate in Atlanta serves South Carolina. You must have an appointment at the consulate to apply in person for the visa. Appointments are made through an online tool. When I first checked, there were no appointments available for the next 3 months! So I called the consulate (which they advise NOT to do) and I was lucky enough that someone answered the phone. The lady who answered graciously took my name and promised she would call me when there was a cancellation. I got a call for an appointment on August 8. There are a number of forms on the French consulate website that must be filled in to accompany your application. They are pretty self-explanatory. The one that stumped me was the proof of medical insurance. I had information on all my coverage but not a statement about services outside the US. I told the interviewer I talked with the insurance company and that my supplemental insurer would become the primary provider outside the US. She wanted to see it in writing from the insurance company. Getting the letter about the insurance meant I had to stay over another day in Atlanta. Lesson learned: don’t be vague about anything. They want proof. That includes a rental agreement, bank account and airline ticket to France. All of this is behind me now. The next few weeks I’m focusing on getting the house cleaned out and taking stuff that didn’t sell to charity or consignment shops. Hopefully I’ll have a few days to enjoy some Low Country activities and visit with friends. Then I’m heading to Atlanta and Birmingham, Alabama to visit family before leaving for Paris on September 9. By the way… just so you don’t think all has been smooth sailing… I was in an auto accident Saturday. A neighbor drove out of her driveway and destroyed the right wheel, fender and bumper of my car. I spent half the day dealing with insurance companies and right now, have no car to use. The car’s probably totaled since its a late model Acura. Never mind, now I don’t have to worry about selling it. If you’re looking for an expat guide book, perhaps this will help. Moving to France is like any other move. You have to pack up your stuff to get there. In my case, that means getting rid of 40 years worth of stuff before I pack. Most things I should have gotten rid of years ago. Instead, I’ve gone from place to place, schlepping all this with me. If it didn’t fit in the new place, it went into storage. Today is a new day. Stuff isn’t as important as it used to be. It’s time to start fresh. Since I have to furnish the apartment in Uzes, a few things are going with me that I think will be useful. I’ll buy furniture and other items when I get there, probably second hand, and sell them when I leave. I’ll be done to one storage place. (Down from 4!) Everything else is being sold. Sometimes love means saying you’re sorry and moving on, alone. Even though I could take my beloved labradoodle, Bentley, with me to Uzes (France loves dogs), I don’t think he would survive the journey. Bentley weighs 65 pounds so he’d have to ride under the airplane along with the luggage for the long flight. He’s frightened by lightening so noisy airplane sounds would scare him to death. It wouldn’t be fair to put him through the stress. He’s going to live with my son and daughter-in-law who have a goldendoodle, Maddy. He’s been visiting with them since my trip to France and he’s happy as a clam. I brought the legal materials home with me so my attorney could check the details. One important fact to know about renting in France, different from in the US, is a “honorarium”. It’s a “finders fee” owed to the agency for handling the rental transaction and it’s shared between the property owner and the renter. It’s quite expensive. In fact, it cost more than a month’s rent for my share. After the papers are all signed, I’ll inspect the apartment to insure all is in order. Then it’s mine! A long stay visa is required for anyone from the US visiting in France more than 90 days. A US passport allows you to be there only 90 days every six months. With a long stay visa you can stay 12 months. Getting a visa is easier said than done in SC. You have to go in person to the French Consulate in Atlanta to start the application process that can take a minimum of 21 days to complete. When I first investigated the consulate website, I discovered you can make appointments for visas only through their online tool. The online calendar showed there were no appointments available until October. So I did what the website said not to do. I called the office. After I explained what I wanted to the nice lady who answered the phone at the consulate, and I told her that all I am planning to do is to spend money in her wonderful country, she said she’d call me when there was a cancellation. I have an appointment August 8. All that’s left is for me to do, after sorting out my stuff, is to get back to Uzes. The timeframe for finishing the visa process is up on the air. But if it goes smoothly, I should be in France by early September. Stay tuned!